I recently bought some new BB7's from Jenson and was replacing V brakes on my Bike. My brother has BB5's but his rotors seem to be the "Clean Sweep" which came with his bike. My recent purchase of BB7's came with the Roundagon rotors and I feel a deep sense of regret in buying them. I really I had no idea they would come with these rotors, I assemed the "Clean Sweep" were the default rotors since that is what my brother has. I then did a search on this website and it seems every BB7 complaint is by people who have the Roundagon rotors and I am yet to find a complaint of those who have the Clean Sweep rotors. I didn't want to spend a fortune on brakes, but now am disappointed I will get horrible performance like many here. Upgrading the rotors will be another $60_shipping which would have put the total cost at $160 for new brakes. I haven't opened them yet and don't want to because UI want the ability to return them if all I am going to be is disappointed. My brothers BB5's have really great stopping and locking out power and I assume that is mostly due to the grooves which enable the pads to get a good grip. Though it seems the BB7's have only a few little holes so there will be drastically more slipping. Are these valid concerns or am I over reacting. I don't want to buy new rotors, I might as well return and buy hydros with good rotors. install them, adjust them, break them in (initial stopping power will be dissapointing, this is normal with ALL disk brake pads, yes, ALL OF THEM!!! 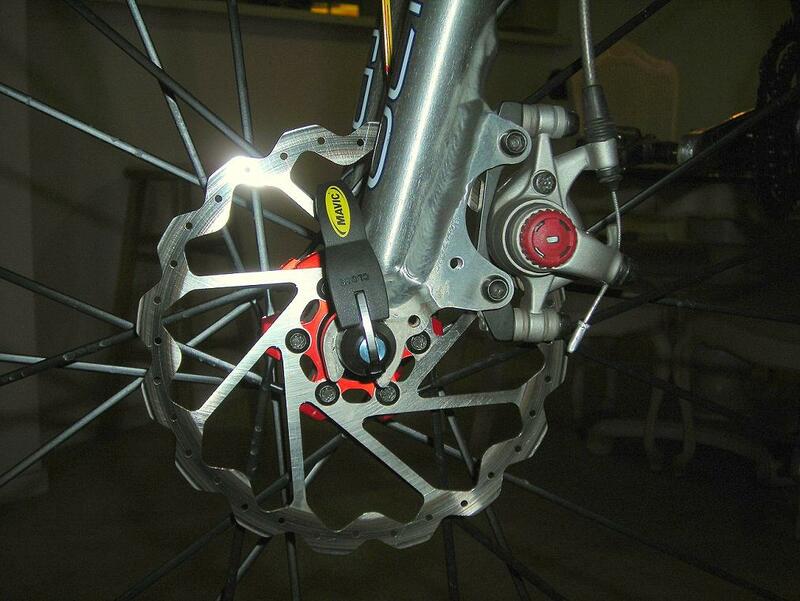 ), re-adjust them, get careless and send yourself OTB from great braking power. The BB7 is an awesome brake, better than some hydraulic brakes, if they dont work it means you screwed up the installation. The only function of the slots in the clean sweep is to help clear junk out and increase cooling. Im a programmer so I understood the spammer. LOL. On another note dont the grooves actually help with creating more friction. Surface area has more to do with cooling capacity rather than amount of friction. I have no issues with the stopping power of my BB7's. Comes down to lever choice and even cables and housing used. Believe it is supposed to take something like 20 stops for them reach there full potential. I do have one gripe about my rotors is they warped on the first ride. In there defense I am a big ole boy and there was tons of downhill, so I used lots of brakes. don't sweat it. The Roundagons have been stock fodder with BB5 and BB7 brakes for a few years now. They perform just fine. If you run into heat fade problems or need to do something like go to a bigger rotor up front or the like, then an upgrade to clean sweeps might be called for. As the others have noted the biggest problem with BB performance is incorrect set up. Just follow the instructions that came with the brakes EXACTLY, and you won't be disappointed. And, as also noted, it does take time for the pads to bed into the rotors. So you won't see the full potential of the brakes right away. But once the brakes are broken in, you'll be able to plant your face in the dirt at will. ^^^And I would agree with you! Just as a data point, I run juicy 3's that came with roundagons, and I've never experienced any squealing or howling that people complain about all over this forum. And most of them have cleansweeps. my back rotor squeals at about a walking pace, but when you are at any real speed I get no noise. For a while I thought my hub was screwed, but its my rotor. From when I took physics, friction and surface area are mutually exclusive, except when you consider pressure. Wider surface areas reduces pressure between the two surfaces, thus negating any increased friction had from extra surface area. Even though some of your comments have given me some reassurance just a search for the word Roundagon on this site brings up horror after horror. I've been running roundagons for a couple years without complaint. They work fine. I do occasionally get some squeel when they cool after being really heated. Well the grooves reduce surface area thus increasing pressure which means more friction. No? All wholes do is help keep the rotor cooler. The cooler the rotor the better the stopping distance. My BB7's/Roundagons work just fine. No problems or noise. I ordered just the front BB7s first and they came with 203 roundagons. About a month later I ordered the rear 185 and it came with a cleansweep G2. I had zero problems with the roundagon up front but switched to a cleansweep after 6 months just so I had matching rotors. The G2 seems to cool quicker once the brake is released according to my IR heat gun. The overall power is about the same. I can't comment on modulation because I switched to ceramic pads front and rear at the same time I installed the G2 up front and modulation was better but it was probably the pads. I wouldn't worry about the roundagon at all. From my understanding of car rotors the slots help to cool the rotor (like the holes), but act mostly to keep an even and clean contact surface between the pad and rotor. They may wear the pads a little faster, but you gain braking performance when pushing your brakes hard. I run BB7s with stock roundagon rotors in 185 F / 160 R sizes. I weigh 265#s kitted up. I ride some pretty heavy downhill sections at my local trails. and while I get howling after they warm up, I've never had they fade on me or feel as if they're overheating at all. I do have some blueing on the front from them heating up, but I properly bed the pads in after I installed them and I get excellent stopping power. What I need is replacement/upgraded cabling now. I've got those jagwire ripcord cables on my bday wishlist LOL i think proper cable tension and caliper alignment will make those roundagons work extremely well. car rotors come in various types. solids for the rears usually. typically rears are only solids b/c they aren't used as heavily as the fronts. the venting comes from the space between the two sides, they have directional veins to cool the rotors off. the driled holes and slots on the face of the rotor are designed to clear debris from the pad face and to aide in cooling. problems arise when you overheat drilled rotors and they begin to crack from the holes outwards as there isn't enough surface material to properly disappate heat from the rotor and pad. solid rotors will generally be your strongest stopping rotor fro a street car and a slotted rotor will aide in higher speed heavier braking applciations. it does happen with MTB brakes, but the fact that MTB brakes are extremely well ventilated and have much smaller pads makes it a very trivial matter.